Employee turnover is one of the top three concerns of companies (along with productivity and performance, which I’ve blogged about previously). That’s because employee turnover equals big bucks. One HR industry measure shows that by reducing turnover just one percent for every 1,000 employees, companies can save an average of $1 million per year. How Do You Define Turnover? Employee separation from your company is defined or measured in two ways: turnover or attrition. Attrition is the number of people leaving a company when their roles won’t be filled, like during a layoff. Turnover is the number of people who leave a company either voluntarily or involuntarily because you ask them to, both resulting in positions that need to be refilled. Turnover rate is calculated as a percentage (we’re talking metrics here, so there’s going to be math). According to the Society for Human Resource Management (SHRM), turnover is the ratio between number of separations and the average number of employees within any given time period (e.g., separations ÷ average number of employees during one month). The average number of employees is calculated by adding the number of employees at the beginning of a time period to the number of employees at the end of the period, and then dividing the sum by 2. A dynamic industry like retail, which has a very fluid workforce, may calculate average number of employees more frequently such as weekly or even daily (i.e., Average Daily Headcount). 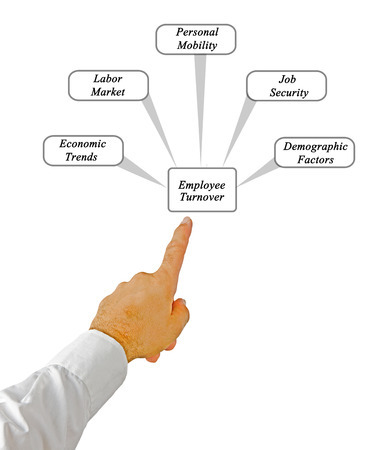 Some people use employee turnover and retention interchangeably. They’re not the same, but they are two sides of the same coin. Higher retention equals lower turnover. Retention is the process of keeping a specified group of employees, typically valued contributors and higher, from voluntarily separating from the company. See our previous blog post on Performance. What Does Losing An Employee Mean For The Bottom Line? When someone leaves your company, you’re not just losing an employee – you’re losing money. You have to factor in what was spent on hiring, on-boarding, and training that employee; the cost of lost productivity while you’re short-handed and bringing a new resource up to speed; and the cost to hire a new person. An employee leaving also affects the productivity and performance of his or her co-workers. There is an average voluntary turnover rate of 11.6 percent across all industries, according to Compensation Force 2015 Turnover Rates By Industry. The cost to replace an employee is about 1.5 times the salary of the person you’re replacing. So if your company has 500 employees with a median annual salary of $50,000, you could be losing an average of $4.35 million each year ($75,000 X 58 employees). How Can Workforce Analytics Help Me Reduce Turnover And Save Money? ZeroedIn measures turnover in your company against a benchmark, often determined by factors such as the industry you’re in. Our tools help identify the root cause of why employees leave, drawn from information collected such as exit interviews, performance reviews, past roles and management relationships, and other patterns from your HR data that you can’t see with the naked eye. ZeroedIn also examines external market conditions. Using these factors and others, our workforce analysis provides insight as to why employees are leaving and calculates the actual costs to your company. What gets measured gets changed. With understanding comes action. (And a whole bunch of other applicable clichés.) Bottom line: With the right tools, you’ll come away with valuable information. Then human resources professionals can tackle the problem of reducing turnover, work on increasing employee retention, and help minimize the damage to your company’s bottom line.